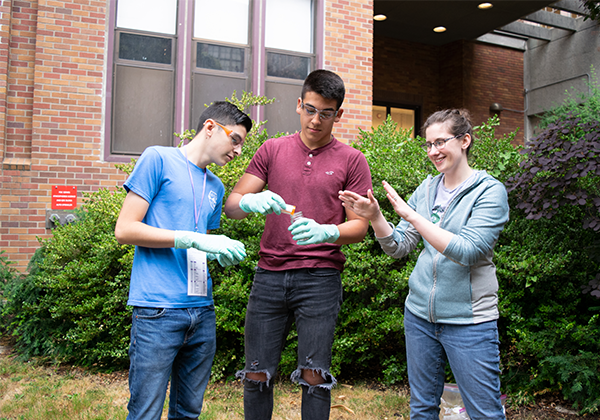 Every summer, the University of Washington (UW) hosts week-long Dare to Dream Academies for high school students from migrant and seasonal-farmworker families. The students experience college living while earning high school credit and exploring opportunities in higher education. The program is funded by the Office of Superintendent of Public Instruction’s Migrant Education Program. UW NASA Space Grant invited AHB Extension to teach during this summer’s Science Academy. Cat Gowan created an energy lesson using a zombie apocalypse survival scenario to make renewable energy topics fun and interesting. “Brrraaaaains…” A game of walking tag started out the lesson. Arms outstretched, the zombies spread the deadly virus throughout the classroom. More alert and engaged, the students then settled in to learn about energy, renewable sources, and bioenergy. We asked the students to imagine how they would survive a zombie apocalypse and how different forms of energy could be used as they escaped, defended, and ultimately rebuilt society in a post-apocalypse landscape. Students talked about how they’d use streams and wind to power turbines to create electricity, but what about bioenergy? Cat Gowan (right) provides guidance as students learn how biodiesel is made. We led the students in a biodiesel-making workshop. They learned how cooking oil could be turned into fuel for transportation, heat, and light. We also talked about how burning wood is a form of bioenergy that is still used by many people in the world as their primary source for heat and cooking. Using a commercial rocket stove, we showed them how wood could be turned to electricity. And, of course, we taught them that wood could be converted to liquid fuels. 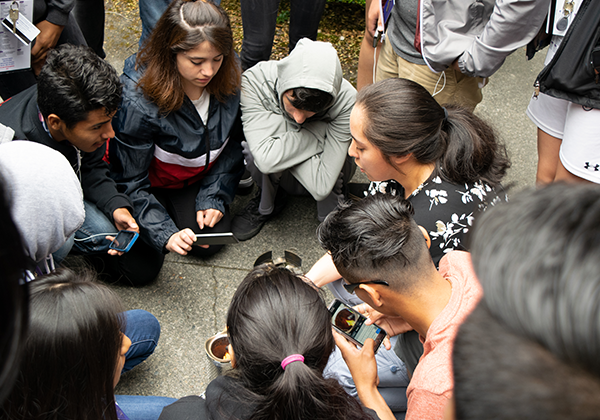 Students huddle around to feel the heat and see the flames of a wood stove that turns twigs into cooking energy and electricity. Demonstrated by Noelle Hart, WSU Extension Coordinator. Look into how you can conserve energy at home. Pay attention to programs your public utilities are hosting and the goals they are trying to achieve. Think about how energy is used in your community. Keep track of local, state, and national energy policies! Later in the summer, the AHB Extension team had the opportunity to collaborate with the NASA Space Grant program once again. On a clear July evening, the team presented at El Centro de la Raza in Seattle’s Beacon Hill neighborhood. El Centro de la Raza acts as a voice for the Latino community in Seattle, promoting awareness and working for strong civil rights protections for all people. We shared AHB’s Spanish language energy outreach display, which featured a question wheel game and an electricity meter to show energy consumption of different types of lightbulbs. 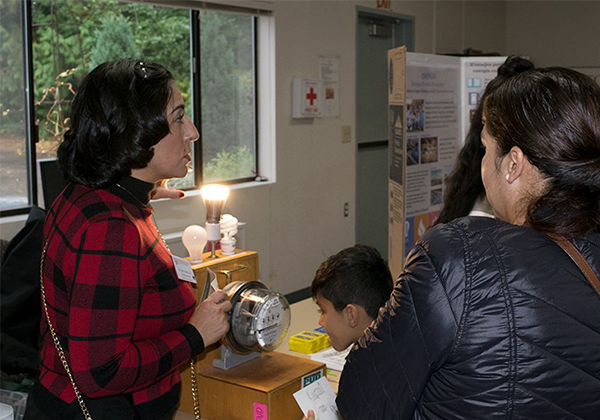 Tatiana Giraldo uses an electricity meter, courtesy of Snohomish County PUD, to teach about energy-efficient light bulbs (as pictured at the Bioenergy Carnival). As the Fiesta got going, a steady stream of residents from the affordable housing development next door, the Plaza Roberto Maestas, came to participate in our hands-on science activities, meet NASA and other scientists, and learn! At our station, visitors expressed amazement that poplar could grow from a tiny stick into a large tree in just a few years. Children and their parents also enjoyed seeing just how much energy a LED light bulb will save you and learning about how to be more energy efficient. Visitors to our table had a great time discovering how we turn poplars into biofuels and bioproducts!